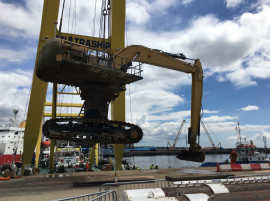 VBMS has pulled ashore the first export cable for Vattenfall’s 92.4MW European Offshore Wind Deployment Centre (EOWDC) located in the Aberdeen Bay, Scotland. 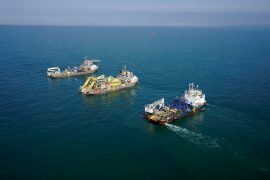 VBMS has expanded its subsea cable storage and handling capacity with new facilities at the port of Vlissingen and at the port of Rotterdam in the Netherlands. 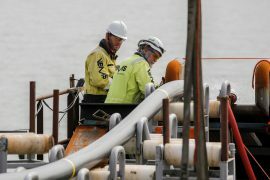 VBMS has signed an EUR 80 million Preferred Supplier and Early Works Agreement for the Triton Knoll offshore wind farm. 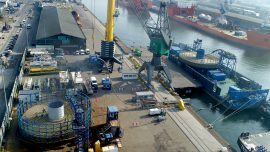 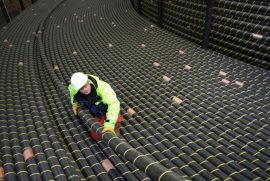 The Boskalis subsidiary, together with NKT Cables, is in charge of the supply and installation of export and inter-array cables. 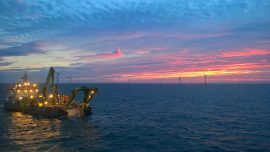 VBMS has installed the final inter-array cable and the second and final export cable on the 336MW Galloper offshore wind farm off Suffolk, UK. 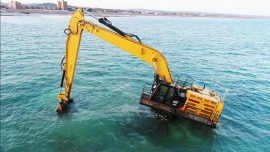 An excavator stranded while working on the Rampion offshore wind project in Sussex has been lifted and brought to dry land. 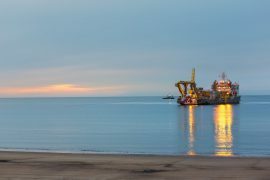 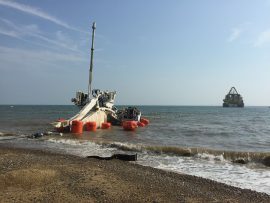 An excavator stranded while working on the Rampion offshore wind project is expected to be lifted on Tuesday, 27 June, according to a Notice to Mariners. 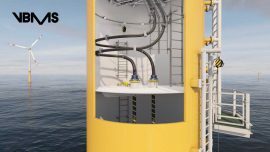 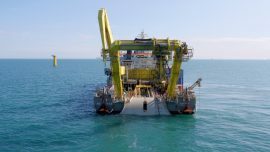 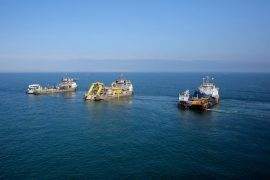 VBMS, a subsidiary of Royal Boskalis Westminster, has been awarded a contract to assist DEME’s subsidiary Tideway with the installation of three nearshore and shallow water sections of export cables for DONG Energy’s 1.2GW Hornsea Project One offshore wind farm. 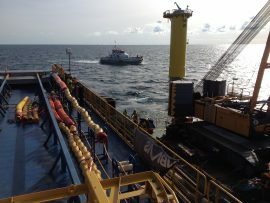 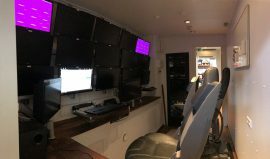 ELA Container Offshore GmbH has recently delivered an ELA Offshore Multipurpose Room to VBMS, which will be used on board their MV Ndeavor, a DP-2 vessel built and outfitted for cable laying in 2013 by Boskalis. 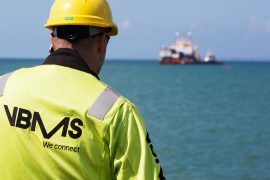 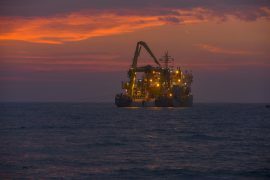 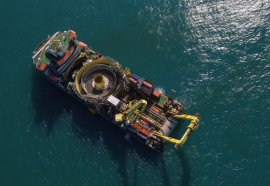 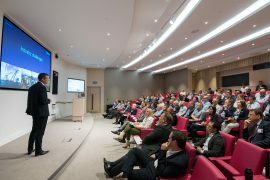 Subsea power cable installation specialists VBMS and High Voltage engineering company EDS have launched their Cable Integrity Solutions including the “Prepare to Repair” framework which is said to allow cable repairs to be carried out up to 70% faster. 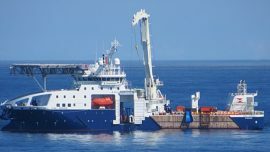 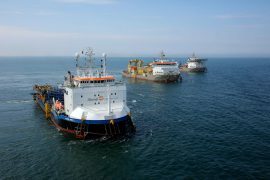 VBMS today shared photos of its three cable-laying vessels: Stemat Spirit, Ndurance and Ndeavor, currently carrying out the inter-array and export cable installation project at the Galloper offshore wind farm in the UK. 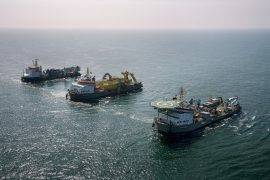 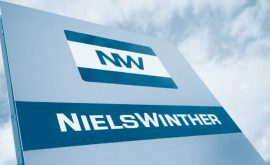 After EnBW recently reached the final investment decision for the 112MW Albatros offshore wind farm and awarded the Tier 1 supply contracts, VBMS – in charge of inter-array cabling – informed that part of the scope is to interconnect Albatros and EnBW Hohe See. 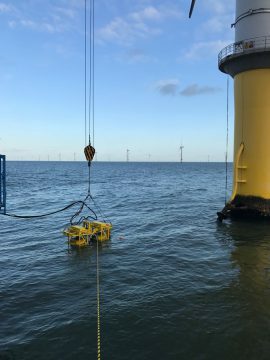 VBMS has awarded JDR the supply of 66kV inter-array cables for the East Anglia ONE (EA1) offshore wind farm, developed by ScottishPower Renewables. 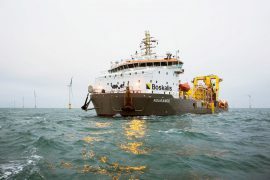 While its mother company Boskalis reported a revenue decline of 20% for 2016, VBMS achieved an 80% increase in revenue from offshore wind projects including Sandbank, Nordergründe, Rampion, Galloper, Egmond, Aberdeen, Borssele and Blyth. 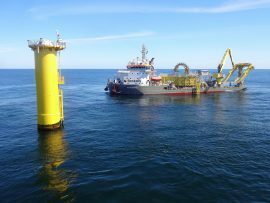 VBMS, a subsidiary of Boskalis, has won an inter-array cabling contract worth approximately EUR 80 million for the EnBW Hohe See offshore wind farm.